It seems that once I stumble upon some beautiful organic bedding, most recently by Rubie Green and Amy Butler, more designs start to come my way in an avalanche. 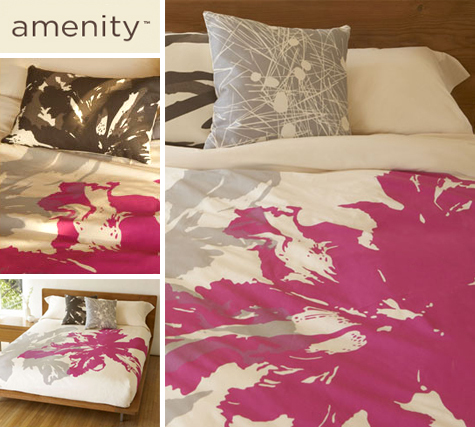 Thanks to my subscription to Amenity’s newsletter, I learned today that they have released their popular Birdseye organic cotton duvet cover in a new fuchsia colorway. This is a bit of a departure for Amenity, because they tend to stick to neutrals. The infusion of a bold fuchsia paired with a light gray is energetic, to say the least. The stark graphic pattern makes the hot color neutral enough that even my husband might agree to let me bring it into our bedroom. I. Want. This. Now.